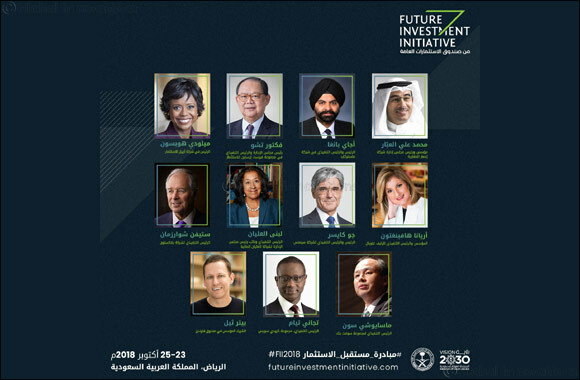 Riyadh, 29 August 2018: The Public Investment Fund (PIF) of Saudi Arabia has today announced the formation of an advisory board, comprised of eleven of the most influential global executives from technology, finance and business, that will support the ongoing development of the program for the 2018 Future Investment Initiative (FII). The second edition of FII is taking place in Riyadh from October 23rd-25th 2018 and will explore how investment can be used to drive growth opportunities, fuel innovation and shape future economies. With a wealth of expertise across multiple sectors and geographies, the 2018 FII advisory board members possess unique insights that will ensure FII remains at the forefront of the global investment debate, unlocking exciting new growth opportunities. The advisory board provides strategic guidance on all elements of FII. They will also be instrumental in advancing new strategic opportunities amongst the international thought leaders gathered by FII. Masayoshi Son, CEO, SoftBank Group Corp.
Twelve cross-sector taskforces designed to explore emerging business and investment trends, and early-stage growth opportunities.